Which is the best desktop VR system (as of Q1 2017)? Also: see video demos from the $400 VR-capable PC. Check out my new video. WHICH IS THE BEST DESKTOP VR SYSTEM? I’ve owned the three primary desktop VR systems, and as of Q1 2017, I believe the best one is the Oculus Rift because of the software.The Playstation VR (reviewed here) has the largest number of users and is also the most affordable system (including both the VR headset and the PS4 and accessories needed to run it). Typically, game developers have an incentive to develop games for the most popular system simply because there are more users. However, the PSVR has a game library dwarfed by the other two VR systems. Moreover, the games on the PSVR tend to be a little more expensive on the average compared to the VR games for the other two systems. Finally, the PSVR’s tracking area is much smaller than the tracking area of the Rift and Vive, limiting it to seated or standing VR experiences.As of Q1 2017, the other two systems, the HTC Vive (reviewed here) and the Oculus Rift (reviewed here) are now quite similar. Both have roomscale VR, and both systems can play most of each others’ games (although some older Rift games cannot be played on the Vive). There are a few tradeoffs between them. For example, on the Vive, you can see concentric rings reflected in certain scenes, while the Rift has “god rays.” And so on, so forth. 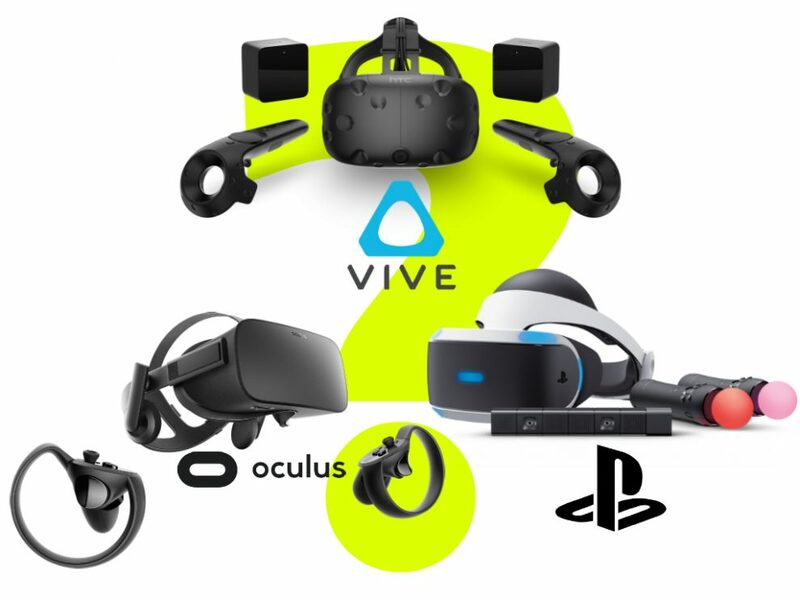 In terms of value for your money, the Oculus Rift and Oculus Touch now have a total cost of $598, $201 less than the HTC Vive ($799). In addition, the free games for the Oculus Touch have a higher production value than those for the HTC Vive. The free games for the HTC Vive vary from time to time but they are currently The Gallery Episode 1: Call of the Starseed (an excellent game), Zombie Training Simulator, Richie’s Plank Experience, and Everest VR. Meanwhile, for the Oculus Rift and Touch, the free games currently include Robo Recall, Dead and Buried, Quill, and Medium. Robo Recall, in particular, was developed with a budget of around $10 million, and it is arguably a killer app for VR. This gap between the games for the Rift and the Vive is not expected to go away anytime in the foreseable future. Oculus has Facebook’s resources backing it, and Mark Zuckerberg has stated that Facebook intends to spend $3 billion over the next decade to grow Oculus. Vive’s manufacturer HTC is also a large company, but it is financially strapped. You can see a huge difference in Oculus Studio games (Robo Recall, the Unspoken, Dead and Buried, Quill, Medium, among many others) versus the handful of Vive Studio games (Front Defense, VR Sports, MakeVR). It is true that you can play all of the new Rift games with the Vive, and Oculus isn’t blocking Vive owners — on the contrary, Oculus now appears to be expecting at least some Vive users to buy Rift games. But meanwhile, some of these games will be free for Oculus owners. This further adds to the difference in value that you’re getting: on one hand, you have the HTC Vive at $799 with mostly indie-produced free games. On the other hand, you have the Oculus Rift + Touch at $598 with high-budget free games. This is why in my opinion, the best desktop VR system right now is the Oculus Rift. WHAT ABOUT THE COST OF A VR-READY PC?